Okay I'm trying to keep calm here. I have a mahoosive list of places that I want to go too. But Sexyfish, well it's been on there a while. I would say out of all the cuisines, Asian food (especially Japanese) is my ultimate favourite. I knew coming here, I wouldn't be disappointed for my March treat from Andrea. 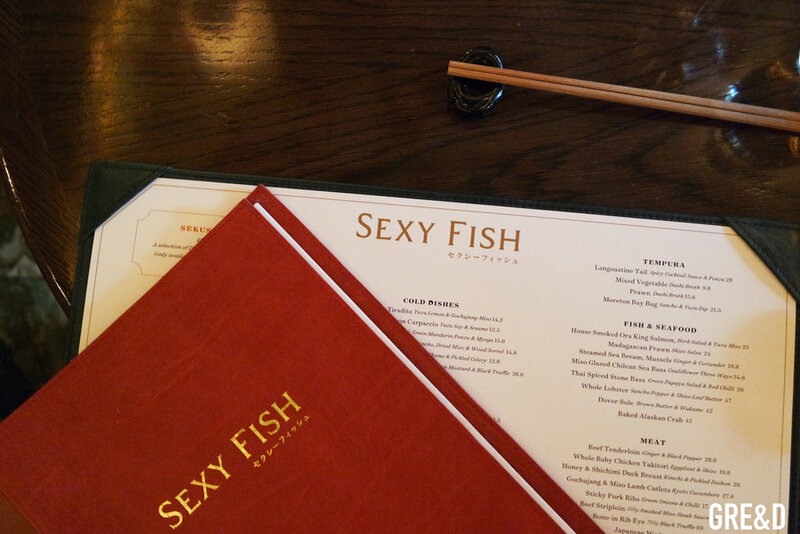 If you're not familiar with Sexyfish let me be straight up with you and say that it is not the cheapest place to eat... so I was very happy to do our usual and go for the set menu. As after all that is my speciality! 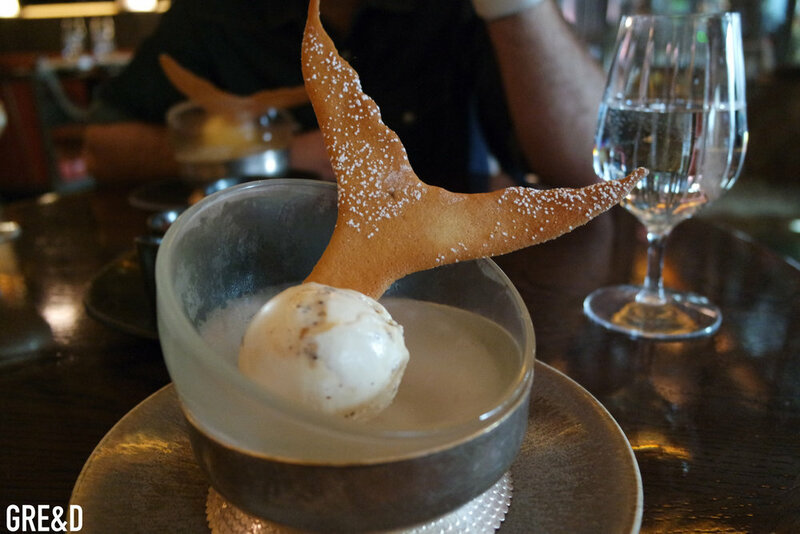 For £36 per head, you got three courses which included an appetiser, two starters and a main. However when taking into consideration about the quality and the craftsmanship of the dishes £36 seems a good bargain. For the appetisers, we couldn't choose but were given a small bowl of miso soup, and some kimchi and pear salad. We were also given a hot hand towel which was nice and refreshing. The kimchi was extremely spicy but it did balance out with the bursting flavour of the pear. Everything came quite quickly. I think it was because the chefs prepare everything so fresh and especially if it doesn't need cooking, it arrives at your table a few minutes after you have ordered. Obviously this is great service but I wanted it to last hours and hours! As soon as I walked in I didn't want to leave. Choosing the starters was so hard, I wanted to try it all. I had to think tactically. If you have seen the menu, there is quite a lot to choose from, and picking two obviously gives you more choice but it's still difficult. In the end, I ordered the Smoked Cured Salmon with Crispy Kale and the Beef Tataki with Topinambour & Yuzu (Jerusalem artichoke & citrus junos in layman terms). 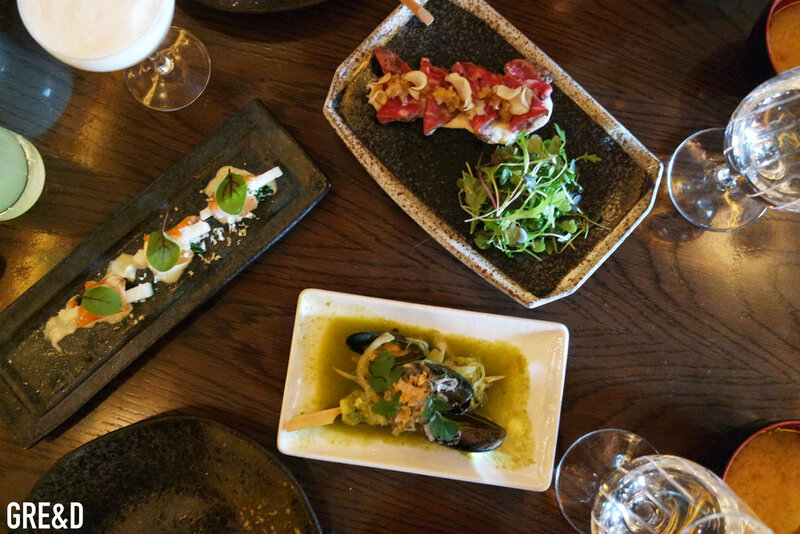 Andrea ordered the Monkfish Skewer with Mussels & Yuzu and a classic, Prawn Gyoza. It was absolutely incredible. The fish was so delicious and luxurious to eat. Even the beef melted in your mouth and the juxtaposition of flavours of the saltiness of the meat/fish with the artichoke just great. Andrea's Monkfish was so meaty and full of flavours from the sea. The Gyoza was different from other gyoza that I have had before. This was more crispy and the flavour felt more authentic. The main meal was also extremely delicious. I had the Chicken Breast, Caramelised Mushroom & Shiso. Andrea had Salmon Fillet with Yuzu Hollandaise. Honestly the chicken was so succulent. It had been cooked with the skin on so all the juices kept the chicken from drying out. On my plate, I had a side of mushrooms and from the moment that I tried them I knew they had been cooked in mirin. I cook a lot of Japanese at home so have an abundance of sauces to create the flavours. If you haven't have mirin before, it is a clear syrup liquid which is pretty sweet. It's a distinctive taste and goes excellent with mushrooms! The sauce was a reduction made from the mushrooms. Accompanying both of our dishes was a side dish of rice which was great that that wasn't added on as an extra. Andrea's salmon was also very tasty. It had a great crispy rim which I love as it adds a bit of texture to the dish. Our 3 courses were done. But we were both tempted by dessert. Honestly the dessert menu I swear was crafted to all my favourite foods. Cinnamon doughnuts, Banoffee Popcorn, Coconut Cake and more! But I was tempted by something a little lighter and more refreshing. Malt and Honeycomb Ice cream - £2.75 a scoop. Andrea chose Clementine which was like eating the fruit whole. However, we were struck with a surprise when it came to our table. A plate of little dishes filled with different toppings; chocolate popping candy, hundreds and thousands, popcorn, nuts and hot chocolate sauce! We had a plate full of ice cream toppings that we could help ourselves too. After eating in a beautiful sophisticated restaurant, we were suddenly eating like children but you know what? It worked. It added fun and excitement into the last course. The presentation still kept it's elegance but I was an extremely happy girl. The interior of Sexyfish is stunning. It's dark wood furnishings is seductive. The windows are tainted so it keeps the inside darker. Sexyfish is also owned by The Ivy, who I have also visited and you can tell because it does have a similar aesthetic maybe minus the giant fish and dragons on the wall!